We offer a network snowshoeing routes from our base, delivering more than 15 km to explore: Treasure Trail (0.5km), Alexander Falls Explorer (3.5kms), Finger Lakes Loop (5.0kms), Old School (2.6kms), Real Life multi-use Trail. The convenience of a single Ski Callaghan admission provides access to the combined trail system of both the CCWA and WOP ski areas as one! 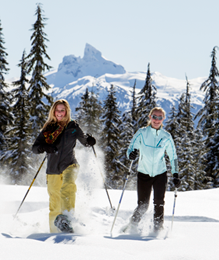 Ski Callaghan offers the complete Nordic experience, whether you are new to Nordic sports or are an elite athlete. One ticket or pass provides you with access to 33.5 kms of snowshoe trails, with the ability to move freely between both areas. 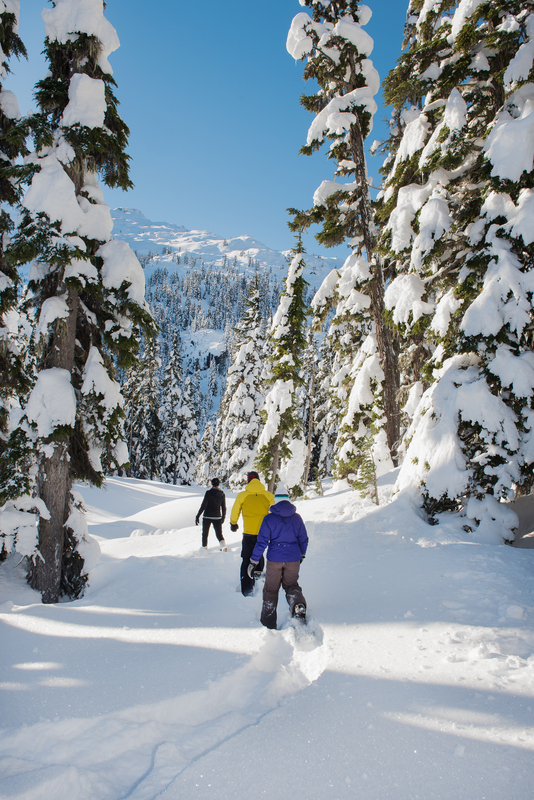 Unlike other venues, snowshoeing in Callaghan Country is the “real deal” allowing you to challenge your personal navigation skills as you wind your way through the wilderness following modest “route” flags. 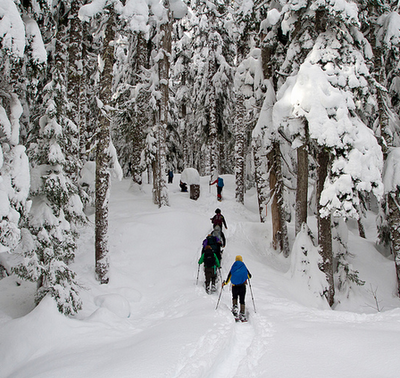 Rather than walking through a commercial snowshoe “track”, experience the more intimate nature of snowshoeing! 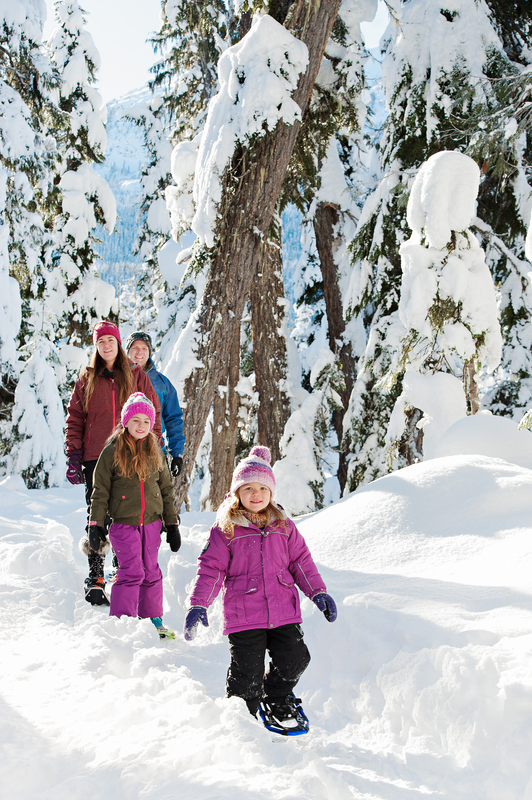 We have also introduced the very short “Treasure Trail”, perfect for families who are looking to get a taste of the snowshoe experience with “little” snowshoers . This trail has the same feel as our other routes, but stays relatively close to our base area. Dogs are welcome on our lower snowshoe loops – as well as on the first 5 km of our multi-use trail, Real Life (dogs must be on leash when on this trail for safety reasons). Please keep your dog under your care and control at all times, and don’t forget to scoop the poop! *In addition to these shorter routes, snowshoers are welcome to use the designated side of our multi-use trail, Real Life / Wild Spirit (12.5 kms) to access the lodge. For those wanting to snowshoe to the lodge, be sure to give yourself plenty of time. Expect it to take at least 5 hours, and maybe more, depending on snow conditions. 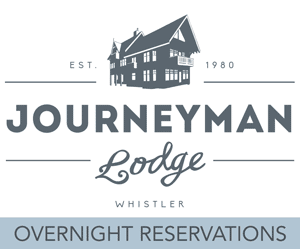 For overnight guests the lodge provides the peace and tranquility of the Solitude valley and unique opportunity explore the old growth forests and sub-alpine meadows by snowshoe. Follow a set loop, or make your own way – the whole sub-alpine valley is yours to discover.